While in northern Thailand I signed up to volunteer for a week at an elephant park. I had done a little research and decided this looked the best one in the area, but I was little prepared for the education I was about to receive concerning the treatment of these creatures in Asia. I’m sure most people think riding an elephant would be a really cool thing to do, totally oblivious to the history of the elephants or the unbelievably cruel training they will usually have undergone to ‘break’ them. 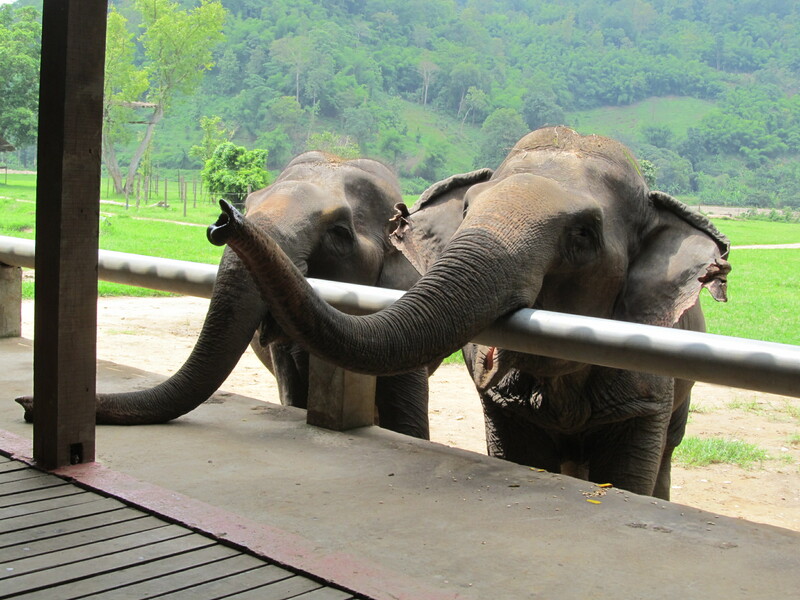 The Elephant Nature Park (www.elephantnaturepark.org) is one of only a few places in Thailand that allow rescued elephants to live a natural life. They do not give rides, they do not perform tricks and they certainly do not work in any way. To me it seemed something of a retirement home for elephants, many of which led lives full of hardship and cruelty before the park bought them and took them in. The animals know they will be fed but can forage all the time, they get daily baths and total freedom from dawn until dusk. They are only confined to a spacious pen at night time as otherwise they may wander off and injure themselves (a few of them are blind). The park was started by a wonderful Thai lady called Lek, and watching her interacting with the elephants there is nothing but love, trust and understanding – from both sides. Whilst at the park as volunteers we were shown videos and told stories of the brutality these beautiful beasts are often subjected to in Asia (specifically Thailand and Burma). Elephants are separated from their mother at a young age and secured in a tiny wooden contraption called a crush. Whilst in the crush for up to a week they are starved and dehydrated, and subjected to much physical abuse while the mahouts train them to follow orders, such as taking a human on their back without complaint. This was difficult footage to watch even for a few minutes; the elephants were in such distress, it broke our hearts. Even worse was looking out to Lek’s elephants at the park knowing some of these poor animals had undergone such a horrific ordeal. I will admit to my own ignorance of these facts before I worked at the park. The reason I am sharing the knowledge is because we desperately need to spread the word and realise that there are things we can do to prevent this happening. There used to be 100,000 wild elephants in Thailand; now there are around 2,500. But another problem altogether are the domesticated elephants that are performing rides and tricks. Many of them were part of the logging industry in Thailand, and were out of a job once this was banned in 1989. So yes, they may have a better life giving you a ride through a river than pulling logs, but don’t they deserve a break and to just be an elephant for what remains of their life? 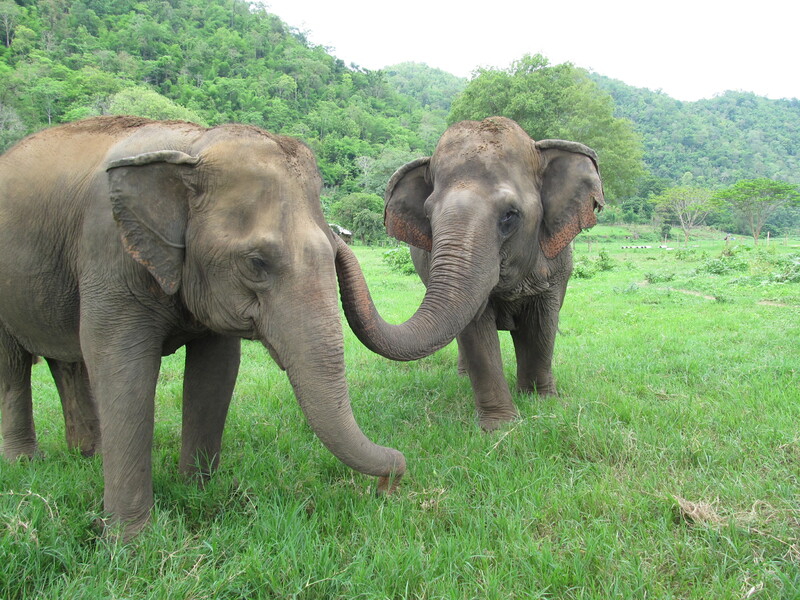 I’ll finish this blog with a story about two female elephants I met at the Nature Park. 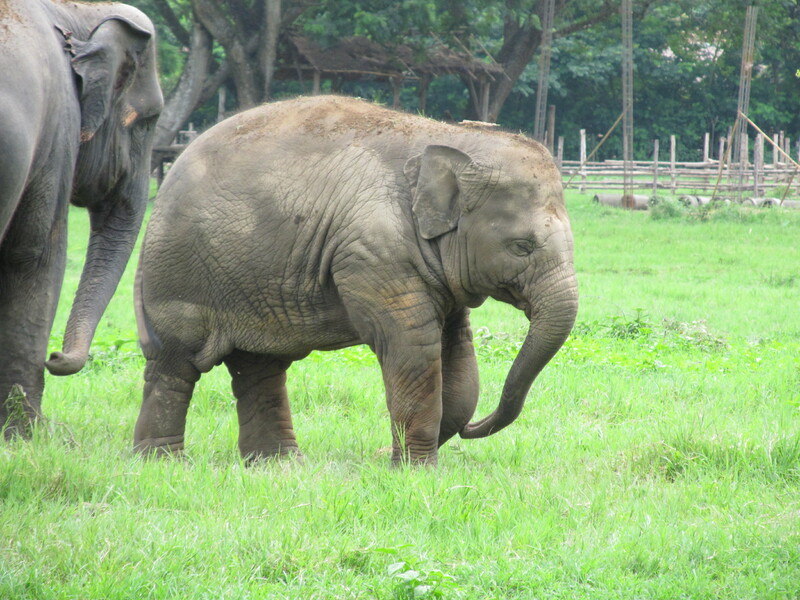 The very first elephant to join the park was Mae Paem, a female who had been kept as a pet by a rich family in Bangkok. She was quite badly malnourished and weak when Lek took her on. Mae Paem is now around 70 years old (no one knows for sure) and is very mischievous in nature – she pretty much does what she wants and ignores the mahouts’ commands until she is ready. After she had been at the park a few years there arrived another female named Jokia. Jokia’s history is difficult to stomach. She had been used in the logging industry in Burma and made to work whilst pregnant. One day she was dragging a log up a hill when she gave birth there and then. The baby fell down the mountain and Jokia was powerless to save its life. After the death of her baby, Jokia was distraught and refused to work. As punishment for her disobedience a mahout used a slingshot to blind her in one eye. The other eye was blinded by repeated stabbing. Completely sightless and emotionally distressed, Jokia could no longer work and was rescued by Lek and the Elephant Nature Park. She is now about 56 years old. As soon as Jokia arrived, Mae Paem took her under her wing. She recognised that Jokia could not see and needed extra help, and ever since has been by her side day and night to make sure she is alright. The bond between them was evident when we were out in the park with them and Mae Paem wandered off to see us all. Jokia became anxious and trumpeted for her friend. 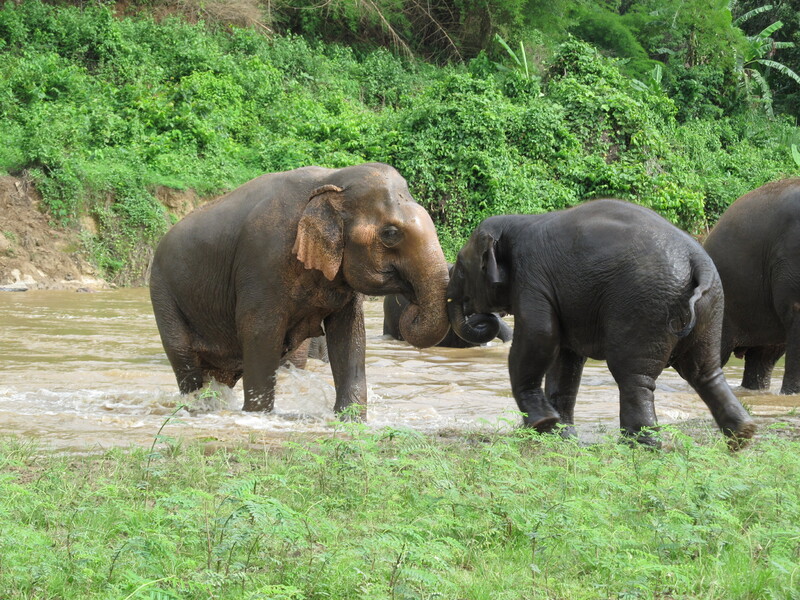 Before we could react, Mae Paem ran over to Jokia and they spent several minutes feeling each others trunks and reassuring one another. It was a beautiful, emotional moment to observe. After that I think we all felt these elephants are not so different from humans really. They live as families (natural or adoptive), they look after one another and, I believe, they know how to love. If you travel to Asia at any time please think twice about riding an elephant or going to a park to see an elephant perform tricks. Remember the way the animals are trained to behave in this way. There is more information on the Elephant Nature Park, near Chiang Mai, at www.elephantnaturepark.org with bios on the herd and if you wish to donate money to the park you can do so through the website. This issue is still as relevant today as when I wrote about it two years ago. Fine way of telling, and nice post to take information concerning my presentation topic, which i am going to present in school.